Small-town ambiance keeps a permanent home in Issaquah, a city with turn-of-the-century origins and 21st century opportunities. Nestled between the Issaquah Alps and Lake Sammamish, Issaquah embraces its Northwest heritage and beautiful natural setting. 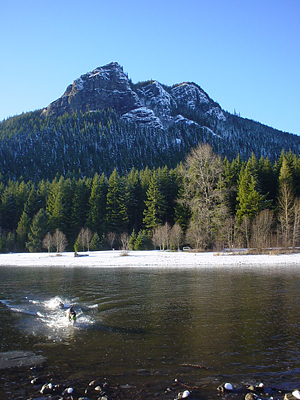 The Issaquah Alps (Cougar, Tiger and Squak Mountains) attract hikers, paragliders and mountain bikers. Each year over 1.2 million people swim, boat, water ski, fish and picnic at Lake Sammamish State Park. The Cougar Mountain Zoo and the Issaquah Salmon Hatchery are also popular attractions. The Hatchery is central to the Salmon Days Festival. More than 150,000 visitors attend this annual Issaquah tradition held the first weekend in October. Other not to be missed notables include the Saturday public market, Boehm’s Candies chocolate factory, the historic Issaquah train depot and the Gilman Town Hall Museum. Numerous shopping and dining experiences are provided at Olde Town Front Street, East Lake Sammamish Center, Gilman Village, and Pickering Place. Cultural offerings include live performances at the award-winning Village Theater, as well as ArtWalk Issaquah on the first Friday of the month from May to September. Issaquah’s charm and livability has brought steady growth. Lovely new neighborhoods in the surrounding hills continue to develop while other housing options include historic homes, homes on acreage and multi-unit urban apartments. Issaquah is also home to the international headquarters for Costco and many other regional offices. Click here for school info and more.